1 of 3 In a bowl, whisk together egg yolks, lemon juice, garlic, anchovy paste, mustard, olive oil, 2 tbsp of the vegetable oil and 1/4 tsp of the salt until well combined. Stir in capers and set aside. 2 of 3 In a saute pan, heat remaining 1 tbsp vegetable oil over medium heat. Add bread crumbs and stir for 2 minutes, until golden brown. Cool. 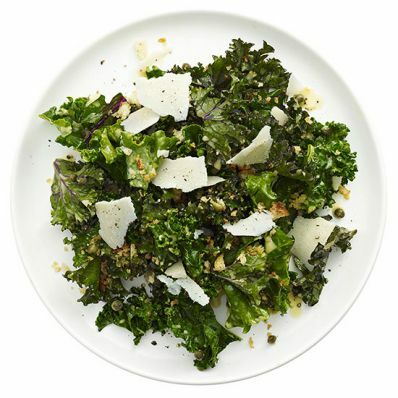 3 of 3 Toss kale with dressing, remaining 1/8 tsp salt and the pepper. Gently fold in bread crumbs and Parmesan. Per Serving: 6 g sat. fat, 16 g carb., 27 g Fat, total, 112 mg chol., 884 mg sodium, 1 g fiber, 9 g pro., 328 kcal cal.